I haven't been this excited about a recipe in a lonnng time. Imagine a cream sauce that is light, silky, creamy & delicious but without the cheese, butter, cream or guilt! You also don't feel like you just ate a brick afterwards. I know what you are thinking, "is there such thing!" or "but can it really be that good?" With much delight I say, YES!!! The first time I tasted it tossed with my favorite pasta, I honestly shed a tear. It is THAT good! I guarantee you will surprise any dairy lover with this recipe. Make it fresh and toss with your favorite veggies & pasta for a super delicious dinner or keep a jar of it in the fridge for a throw together lunch. My hubby Max & Daughter Ella, love this sauce! Ella is 1 and all she kept saying was "mmmm! and signing "more, more"! I hope you enjoy it as much as I do & please share with your friends! Cooking is something to be shared & enjoyed, it shouldn't be something you dread or think you can't do. My job is to help you build a repertoire of fresh, healthy, go to recipes that you can whip up in no time! Check out my next blog post for my Capellini Alfredo recipe using this sauce! To soak cashews place in a medium bowl and fill with warm water until cashews are completely covered. Let soak for about 4-5 hrs or overnight. OR to speed up the process you can soak in super hot water for 30 minutes (Just blend longer!). For an even quicker method, place the cashews in a medium bowl and cover with water. Microwave for 6 minutes for 3 minutes at a time. The soaking of the cashews is super important and is what creates such a smooth & creamy texture. Once the cashews are soaked, drain the water. 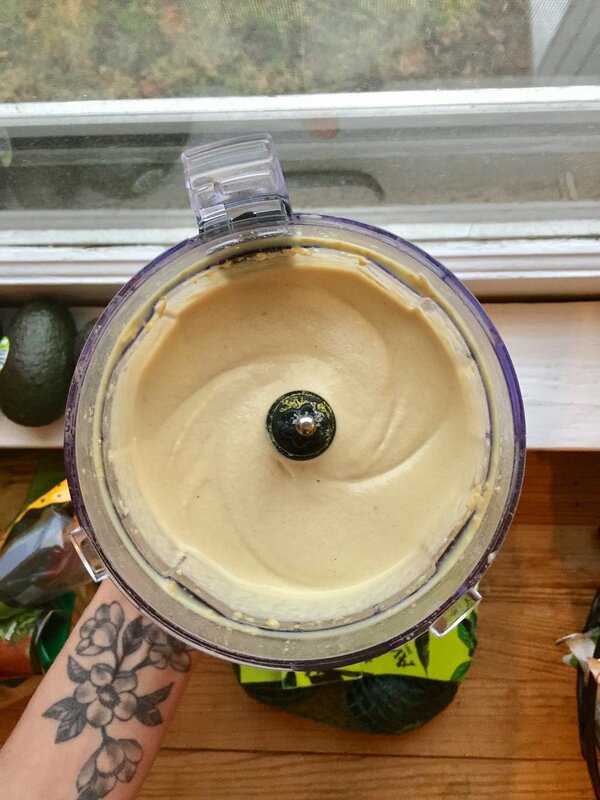 Place cashews, nutritional yeast, s&p, and 1 1/2 cups of the almond milk into a food processor. Blend on high speed to combine. Slowly drizzle in olive oil. Blend on high for 2-3 minutes until super smooth and silky. Taste and add more seasoning to your liking. Now you can either store in an airtight container and save for up to 2 days or if you are like me and rarely have anything prepared in advance then follow the next few steps. Transfer the cashew cream (I saved about 1 cup to store in the fridge) and heat on medium low for 5 minutes. Be sure to whisk frequently so the bottom doesn't burn. Add in the remaining 1/2 cup of almond milk to thin. Toss in your favorite pasta & sautéed veggies & there you have it! A super delicious healthy, creamy Vegan Alfredo! Head over to my next blog post for the Capellini Alfredo recipe which is perfect with this sauce!